One month after Election Day 2012, it was big news in Washington, that Sen. Jim DeMint (R-SC) had been selected to be the new president of The Heritage Foundation. I recall thinking that most people were unaware of the conservative think tank that since 1973 had played an enormous role in the halls of Congress and in the Oval Office providing timely, excellent data to help shape the outcome of legislation and policy. At the heart of the Foundation was an extraordinary man, Ed Feulner. I suspect he remains unknown to most outside the nation’s capital, but, despite the many honors he has received over the years, he did not seek the spotlight, preferring instead to build the Foundation which is the rock upon which the conservative movement in America has been built. 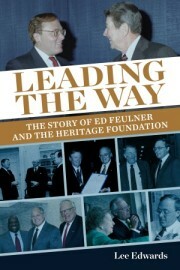 Lee Edwards, an author and chronicler of conservatism, has added a new book to the eight he has already written, “Leading the Way: The Story of Ed Feulner and The Heritage Foundation” ($27.50, Crown Forum). Earlier books he has written include “The Essential Ronald Reagan” and “Goldwater.” The new book is a meticulous review of Feulner’s life and the step-by-step growth of The Foundation from a very modest beginning to its present status, acknowledged by all who know how power is exercised in Washington, as one of the most influential—if not the most influential—of the think tanks that call it home, most notably the Brookings Institution, the Rand Corporation, the Cato Institute, and the Competitive Enterprise Institute. Edward’s book is also a history of the conservative movement in America since the days when Barry Goldwater got trounced by President Lyndon Johnson in 1964 election. The presidency has, since the days of Franklin D. Roosevelt, moved back and forth between the parties. For the Republicans, there was Dwight Eisenhower, Richard Nixon, Gerald Ford, Ronald Reagan, and the Bush’s, father and son. One thing that is evident in Edward’s book is the way many Republican presidents also embraced aspects of Big Government and that includes the legendary Ronald Reagan who, despite introducing key conservative principles, nonetheless had been unable to cut government spending. In the first six years he was in office, it had risen from 22% to 24% of GNP. Reagan, however, did lower taxes and preside over eight years of near constant economic growth, built the nation’s defense capabilities, contributed greatly to the collapse of the Soviet Union, and put in motion many of the policies the Foundation. Reagan was followed in office by Bill Clinton who had run from a center-right position, embracing many of the policies the Foundation had long espoused. In one of the ironies of politics, his legacy was actually enhanced when in 1994 Republicans captured control of Congress after forty years in which Democrats had expanded government and its many entitlement programs. The welfare program he twice vetoed became law and now he cites that as one of his achievements. All during the years since the 1970s, Feulner had been building the Foundation, gaining the support of deep-pocket donors like Joseph Coors, the beer magnate, expanding its membership, and, most importantly, creating a staff of some of the most brilliant minds on a range of issues from the economy, foreign affairs, welfare, education, and defense, among others. From the beginning, they turned out scholarly, but pragmatic research papers that were distributed to the members of Congress to aid them in understanding the legislation that demanded facts to either support or defeat. As time went along, the Foundation expanded its mission using public relations and communications techniques to reach the public. Its staff appeared on television, gave radio interviews, and speeches to convey the conservative approach to government. Throughout most of its years, the Foundation had scrupulously avoided being a lobbying organization. That changed when Congress passed the Honest Leadership and Open Government Act in 2007, an expansion of the 1995 Lobbying Disclosure Act. It became obvious that the Foundation needed a separate arm to engage in lobbying in the D.C. world of “the permanent campaign.” The Heritage Action lobbying arm would not get involved in the electoral races, but one of its first successes was getting the House to repeal the Obamacare legislation, though the repeal had no chance in the Democrat controlled Senate. That could change after the 2014 midterm elections. Recall that, in 2010, two years into President Obama’s first term, Republicans picked up 61 seats in the House, exceeding the 53 captured in 1994 Gingrich revolution, and six seats in the Senate, drastically reducing the Democrat majority. It also added six new Republican governors. There is every reason to believe that the still-sluggish economic growth, the continuing high unemployment rate, and the negative impact that Obamacare is already having that even “low-information” voters will want change in 2014. The Tea Party movement continues to thrive and they had a significant impact in 2010. Just over 41% of voters self-identify as conservative. A large number now call themselves independents—disappointed with both parties. They will lean toward worthy conservative candidates who can articulate the conservative message. The Heritage Foundation will be there to ensure that message is heard and to continue its constant generation of research studies to aid those in office fighting for conservative principles. Your followers may find this an interesting article?